This document contains the site profiles for all displacement sites identified in Adamawa state, Nigeria. 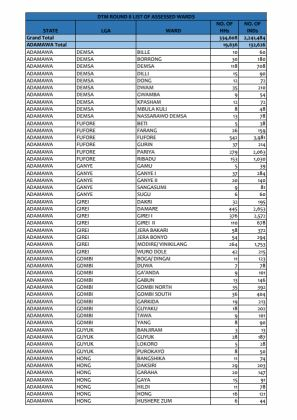 This document lists all the wards assessed in DTM Round 8 by state, Local Government Area and ward, showing the total number of displaced individuals and households identified. 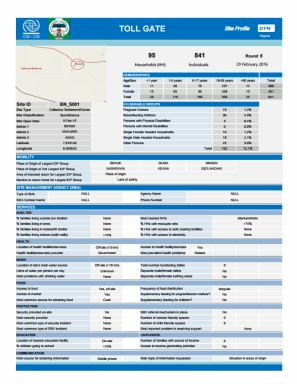 This document contains the site profiles for all displacement sites identified in Borno state, Nigeria. This document contains the site profiles for all displacement sites identified in Kaduna state, Nigeria. This document contains the site profiles for all displacement sites identified in Taraba state, Nigeria. 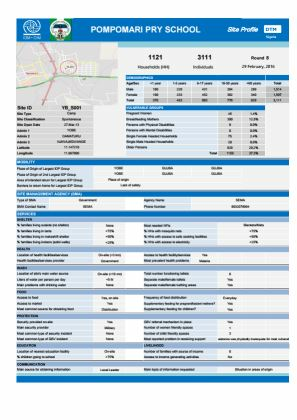 This document contains the site profile for the displacement site identified in Kano state, Nigeria. 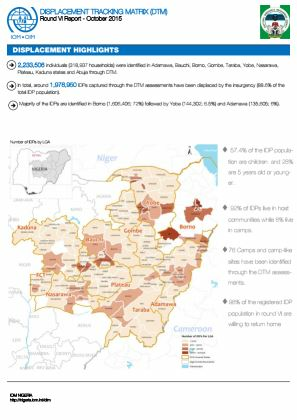 2,241,484 IDPs (334,608 households) were identified in Adamawa, Bauchi, Benue, Borno, Gombe, Taraba, Yobe, Nasarawa, Plateau, Kaduna, Kano, Zamfara states and Abuja. 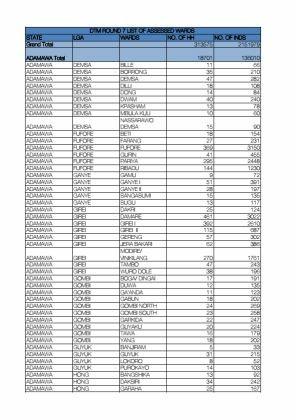 The highest number of IDPs are in Borno (1,525,404 IDPs), followed by Yobe (139,550) and Adawama (132,626 IDPs). This document contains the site profiles for all displacement sites identified in Yobe state, Nigeria. 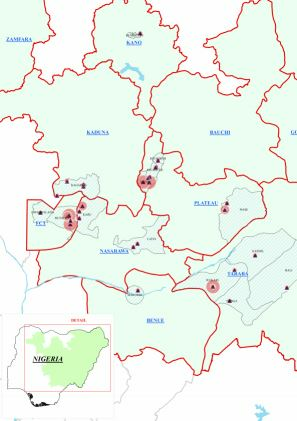 This document contains the site profiles for all displacement sites identified in Nasarawa state, Nigeria. 2,241,484 IDPs in 334,608 households were identified in Round 8 assessments from January to February 2016. 55% of the IDP population in the sites are children, 53% are female. 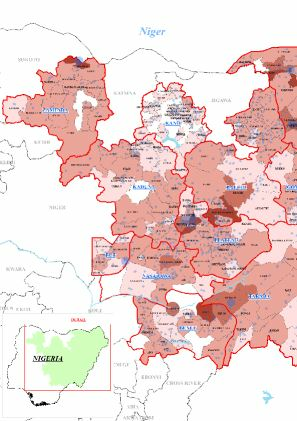 The dashboard includes a map of displacement severity by Local Government Area (LGA) and ward. This document contains the site profile for the displacement site identified in Benu, Nigeria. 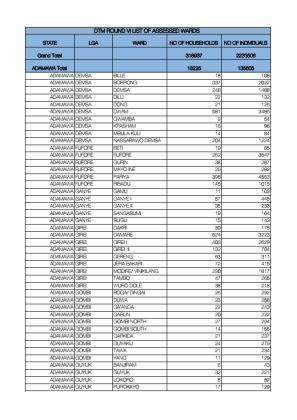 This document contains the site profiles for all displacement sites identified in the Federal Capital Territory, Nigeria. 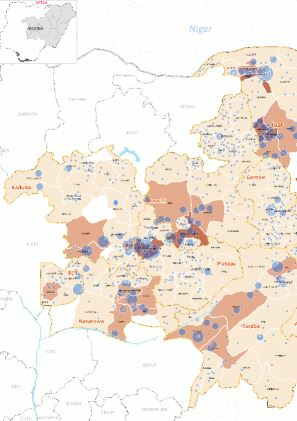 This document contains the site profiles for all displacement sites identified in Plateau state, Nigeria. 186,268 IDPs in 34,240 households were identified in 84 displacement sites. 54% of the IDP population are children. The dashboard includes a map showing the location and population of sites by Local Government Area (LGA) assessed. 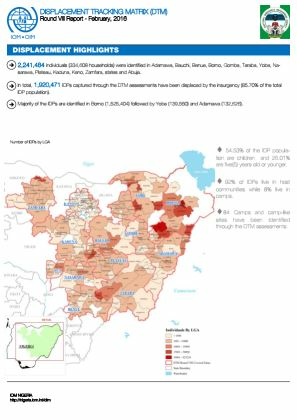 2,151,979 IDPs (313,575 households) were identified in Adamawa, Bauchi, Benue, Borno, Gombe, Taraba, Yobe, Nasarawa, Plateau, Kaduna, Kano, Zamfara states and Abuja. Borno state (1,434,149 IDPs) has the highest number of IDPs, followed by Adamawa (136,010 IDPs) and Yobe (131,203 IDPs). As of October 2015, 2,233,506 IDPs in 318,937 households were identified in the sixth round of assessments. 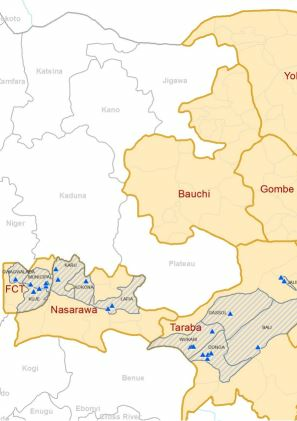 The dashboard includes a map of displacement severity by Local Government Area (LGA) and ward. 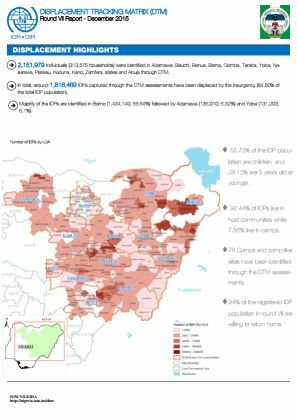 2,233,506 IDPs (318,937 households) were identified in Adamawa, Bauchi, Borno, Gombe, Taraba, Yobe, Nasarawa, Plateau, Kaduna states and Abuja. 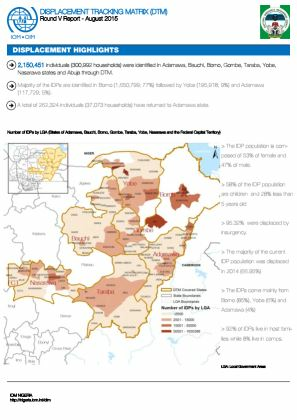 Borno state (1,606,406 IDPs) has the highest number of IDPs, followed by Yobe (144,302 IDPs) and Adamawa (135,605 IDPs). This Site Assessment Dashboard identified 189,011 IDPs (28,983 households) in 76 camps and camp-like settings. 52% of the IDPs identified are children and overall, most IDPs are women between 18 and 59 years old. 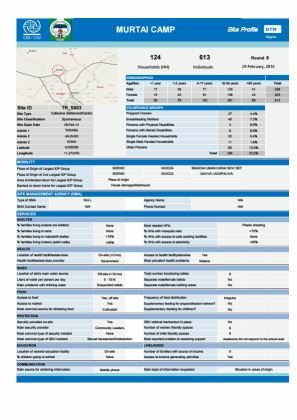 As of August 2015, this Site Assessment Dashboard identified 2,150,451 IDPs (300,992 households), of which 170,368 IDPs were staying in 59 camps and camp-like settings. 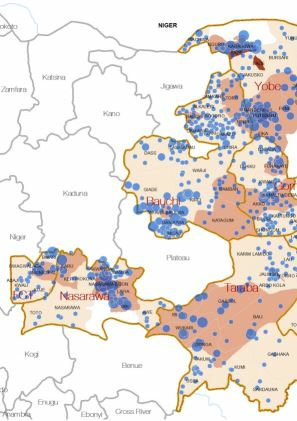 Most IDPs were identified in Borno, Adamawa, Abuja and Yobe. 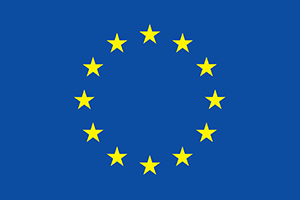 As of August 2015, 2,150,451 IDPs or300,992 households were identified in the fifth round of assessments. 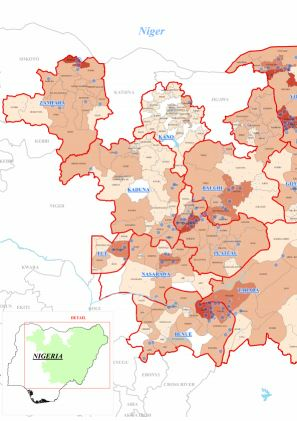 2,150,451 IDPs (300,992 households) were identified in Adamawa, Bauchi, Borno, Gombe, Taraba, Yobe, Nasarawa states and Abuja. Borno state (1,650,799 IDPs) has the highest number of IDPs, followed by Yobe (195,918 IDPs) and Adamawa (117,729 IDPs).